Celebrating art and culture, the French city of Nantes will once again turn into a city-wide summer festival from the 30th June to the 26th of August. Named Le Voyage à Nantes, the arts festival interweaves contemporary, site-specific works with Nantes’ cultural and historical riches, as well as allowing for a multitude of complementary events. This year, over 50 artists have taken part in Le Voyage à Nantes, guaranteeing that visitors and locals alike will be able to experience something new among the range of public artworks. New pieces will sit alongside artwork from previous years, while exhibitions and events take place across the streets, squares and quays of the city. Visitors shouldn’t worry about getting lost – everything will be linked by a ten-mile long green line that loops, encompassing all the main attractions of the festival and the historic city sites. French artist Philippe Ramette is presenting a series of sculptural Eloges (Odes) for Nantes this year; each piece will subvert the traditional monument of great historical figures. 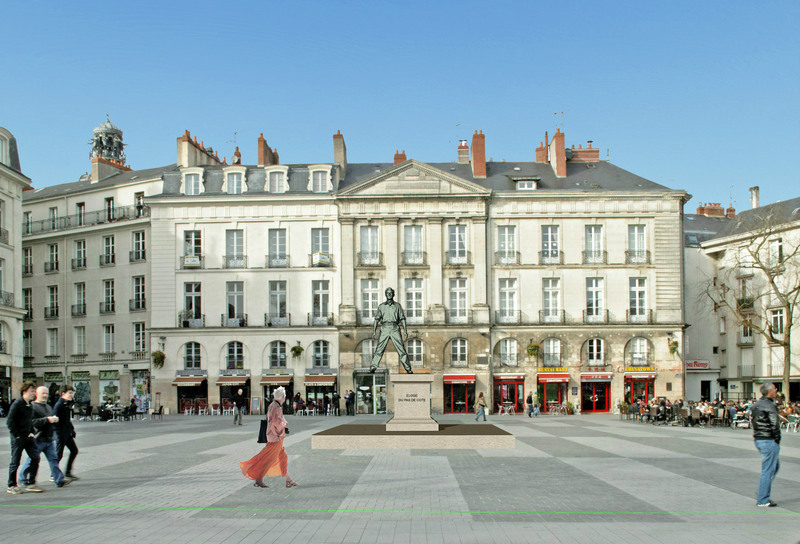 His work in the square of Place du Bouffay will depict a man in a suit, with only one foot standing on the base of the podium while the other hovers in the air. Another, Eloge de la transgression, features a school girl climbing on to a vacant pedestal. Meanwhile in one of Nantes’ most public city squares, Place Royale, Michel Blazy has created an installation that explores nature’s ability to spread in surprising places. Blazy will interfere with the workings of the Place Royale’s fountain, redirecting the water flow so that jets of water spill onto the square and disrupt the sculpture’s purpose. One of the biggest highlights at Le Voyage à Nantes 2017 was the long-awaited reopening of the Musée d’Arts de Nantes; transformed and extended by London-based architectural practice, Stanton Williams, the Musée d’Arts de Nantes is one of the largest Fine Arts museums outside of Paris. This year, the museum will present American artists James Turrell’s central, immersive work, Cherry, in the patio. In another area of the museum, Thierry Kuntzel’s interactive installation, The Waves, will be on display. 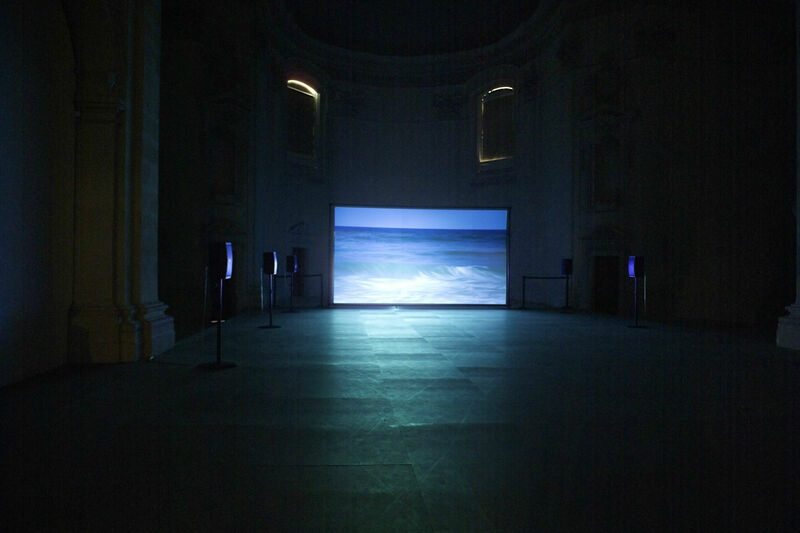 A tribute to Virginia Woolf, in the installation visitors can watch waves crashing against the shore on a screen; but as they approach the video, the images will slow down and the background sound of the sea will fade. The Musée d’Arts de Nantes will also have their contemporary art collection on display, with works by artists including Picasso, Kandinsky and Max Ernest. Le Colibri géant dans la Galerie des Machines. Les Machines de l'île. Concerts and nightclubs will bring music to the city throughout the festival; playgrounds and ping pong tables will be reimagined, creating a playful, child-friendly area of Le Voyage à Nantes where visitors will also find Machines d’Île. 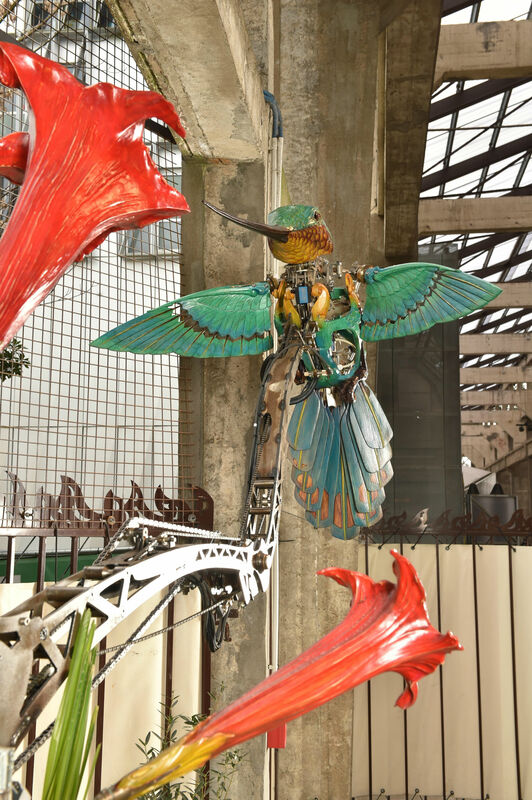 One of Nantes’ most popular attractions, throughout the festival Machines d’Île will be showing their new prototypes of a mechanical hummingbird, and mechanical geese, which will adorn the ‘Heron Tree’. This year marks the seventh annual Le Voyage à Nantes in the artistic French city, with the festival engaging all of the city’s cultural institutions, local businesses, universities and museums to make the event unique and unforgettable for both residents and visitors. Nantes has now garnered a reputation as one of France’s most creative cities – and the jewel in its crown, Le Voyage à Nantes, demonstrates the way art has value every single day.